An American yankee in Canada: Spring Fashion? Wondering how hard this would really be to fashion out of garden produce? 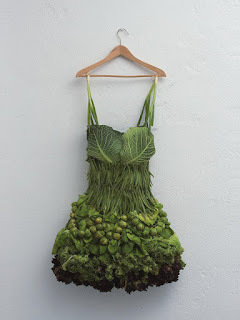 It looks like it is made from cabbage leaves, green beans, brussels sprouts, spinach and finally kale around the hem. Oops forgot the green onion spaghetti straps. And, the vegetarian in your life would be so excited over this! rabbits following would be a neat trick !~!